A house originally built when Hackney was cherished by the social elite for its clean air and greenery is a suitably historic place in which to set this blog's first post. Sutton House sits on the bend where Urswick Street meets Homerton High Street, a restored reminder of 16th century power and gentility amid today's harsh urban greys. The National Trust now owns it and holds occasional family open days. Sheila, Fourthborn, Fifthborn, Sixthborn and I spend a few hours there earlier making marzipan bugs in the Tudor kitchen, dressing up in Tudor clothes and hearing the story of how Henry VIII dumped Anne of Cleves and bumped off Anne Boleyn with the help of Thomas Cromwell who lived just up the road in an earlier version of Brooke House and the latter's upwardly-mobile servant Ralph Sadleir, the man for whom the premises was built. Despite the grumpiness of the staff in the cafe and its child-unfriendly menu, these open days provide a tranquil, uncomplicated way for the type of local parent who wants their kids' entertainment to contain some improving element. Hackney may have long since ceased to be posh but there's still a few of us pushy types about. Child-unfriendly? They do a cracking (crackling, even) roast dinner there on a Sunday, for only £6! You could even split one between two kids. 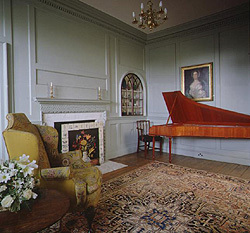 Sutton House is a wonderful oasis, isn't it - all that lovely calming panelling. A good friend of mine remembers going to parties there in the 80s when it was, she says, a squat. Can you imagine?? And it's haunted, on the top floor, by a couple of dogs. But the top floor isn't open to the public, I don't think.